For sale are ten (10) God's Eye Scout SWAP or Craft Kits. 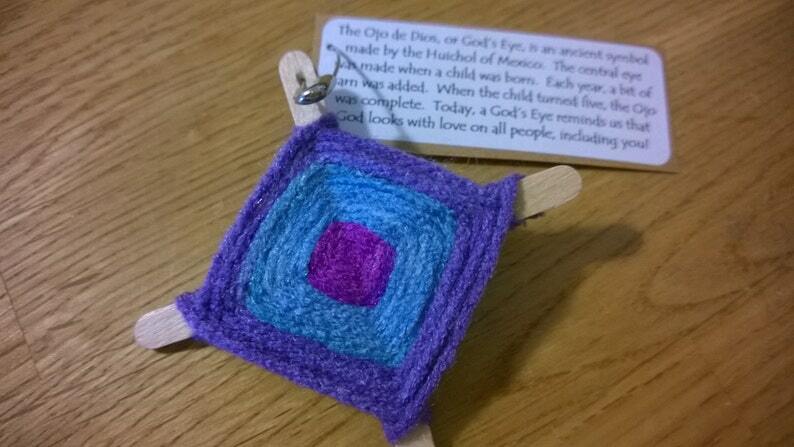 The Ojo de Dios, or God’s Eye, is an ancient symbol made by the Huichol of Mexico. The central eye was made when a child was born. Each year, a bit of yarn was added. When the child turned five, the Ojo was complete. Today, a God’s Eye reminds us that God looks with love on all people, including you! Each kit comes with a pre-made frame with split ring already attached, a safety pin, and pre-measured yarn to create a multicolored God's Eye. Pick between three color-palette choices: blue and green, camouflage, and purple and blue. Or, you can send us a custom order request if you have other colors in mind. Each kit also includes a tag that says: "The Ojo de Dios, or God’s Eye, is an ancient symbol made by the Huichol of Mexico. The central eye was made when a child was born. Each year, a bit of yarn was added. When the child turned five, the Ojo was complete. Today, a God’s Eye reminds us that God looks with love on all people, including you!" Finally, the small piece of pre-cut Duck Tape in each kit helps finish off each piece. You can add pieces of nature (e.g. rocks, leaves, acorns, moss, seashells) to your God's Eye. You can also add a scroll of paper with a wish or prayer. Simply use the yarn layers to hold these embellishments in place. These SWAPs are perfect for so many events: summer camp, day camp, camporee, church camp, VBS, confirmation, baptism, and more! God's Eye SWAPs are also perfect for a World Thinking Day event or badge work. Unlike any other SWAP, the God's Eye is a reminder of God's love for everyone! All of our craft kits are individually packaged. JUST ADD SCISSORS!